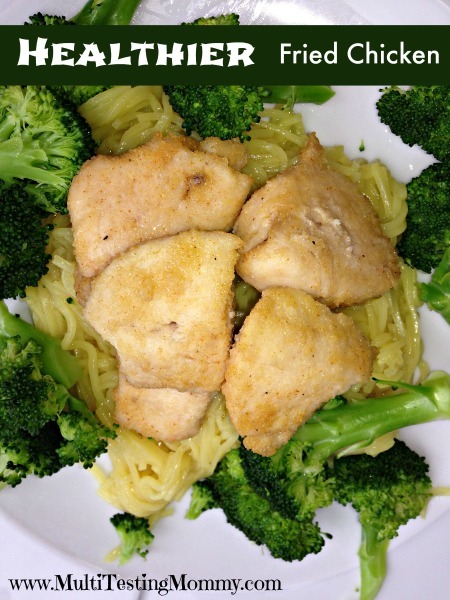 While searching for a Delicious Chicken Recipe, I came across Sunshine and Sippy Cup’s Healthier Kickin’ Chicken Recipe. I modified it slightly according to what I had in my kitchen and made it last night for dinner. It was absolutely DELICIOUS and will definitely be added to our regular dinner routine. Cut chicken breasts into smaller chunks. Stir chicken into oil seasoning and mix well. Let sit in fridge for anywhere between 20 minutes up to overnight. Spread chicken mixture on a baking sheet and bake at 375 degrees for approximately 20 minutes or until the internal temperature of the chicken reaches 165 degrees F.
Serve on a bed of rice or noodles with vegetables of choice. Tagged chicken, fried chicken, healthy food. Bookmark the permalink. I love fried chicken .. love this idea. Thank you so much for sharing, I will be sharing it with my Mom as well! Let me know how you like it, Darlene! YAY! That just made my day – thank you SO much for letting me know, Darlene! Thanks for sharing, we love Fried Chicken but never have it because it is not good for us. Will have to try this recipe out! Judy – be sure to come back and let me know what you think! This looks delicious. I love crispy fried chicken but never make It because of the fat content. This looks much healthier. This wasn’t super crispy, BUT it was SO good! I will give this a try, thanks! I had not heard of avocado oil before this. Where do you find it? Heidi – I buy mine at Costco usually, but I actually just ran out and found some at Loblaws with the regular oils. wow this looks and sounds delicious! will definitely give it a try. thank you for the recipe! This looks good! I’ve been looking for new marinades for chicken. I’ve never tried avocado oil before. What is the benefit of using it over another type? I get so confused with all the different types of cooking oils!! That looks really good. Thank you for sharing. I’ll have to try it next time we have chicken for dinner. Let me know what you think of it when you try it! Looks delicious! I wonder how it would work if I roll it in crumbs (bread crumbs or another variation) to add a bit of crispiness without added fat? Yes, perhaps! Let me know if you give it a try! And this one is very flavourful! Sounds like something all of us will eat-and love! Great idea! Definitely trying this recipe!